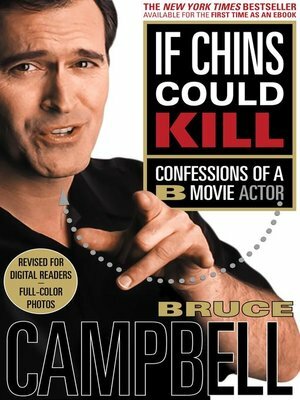 If Chins Could Kill: Confessions of a B Movie Actor Here we are together in the digital universe. Somehow, you've clicked yourself to this page. If you came here of your own free will and desire, you and I are going to get along just fine. Life is full of choices. Right now, yours is whether or not to download the autobiography of a mid-grade, kind of hammy actor. No-and that's exactly the point. You can download a terabyte of books about famous actors and their high-falootin' shenanigans. I don't want to be a spoilsport, but we've all been down that road before. Scroll down to that Judy Garland biography. You know plenty about her already-great voice, troubled life. Scroll down a little further to the Charlton Heston book. Same deal. You know his story too-great voice, troubled toupee. The truth is that though you might not have a clue who I am-unless you watch cable very late at night-there are countless working stiffs like me out there, grinding away every day at the wheel of fortune. If Chins Could Kill: Confessions of a B Movie Actor documents my time in blue-collar Hollywood, where movies are cheap, the hours are long, and the filmmaking process can be very personal. To keep up with the times, I've digitized Chins. It was originally published in hardcover/analog fifteen years ago, which is a vast amount of time in the evolution of books and technology, and it was time to get current. The advance of technology is great for a book like this, which is jammed full of pictures. When it came out originally, the photographs all had to be black and white and moderately sized on the page. Now, any photo that was originally taken in color can strut its stuff. Overall, the resolution of the images is off-the-charts better than the first go-around. This is one "sequel" that I'm happy to be a part of, since we could make so many technical improvements. The process was very similar to restoring an old movie. Since I knew that it was going to be reissued, I also had a look at the story being told and decided to condense, move, or clarify some chapters, all or in part. I also tried to add a hint of historical context, since it has been a decade and a half since Chins first came out.